Dubai, UAE, July 04, 2018: AUDI AG, Ducati, Ericsson (NASDAQ: ERIC), SWARCO, the Technical University of Kaiserslautern, and Qualcomm CDMA Technologies GmbH, a subsidiary of Qualcomm Incorporated (NASDAQ: QCOM), today announced Europe’s first live demonstration for C-V2X direct communication interoperability between a motorcycle, vehicles and roadside infrastructure. The companies, which formed the Connected Vehicle to Everything of Tomorrow (ConVeX) consortium last year to carry out the first announced C-V2X trial based upon the 3rd Generation Partnership Project’s (3GPP) Release 14, held the demonstration in Ingolstadt, Germany. 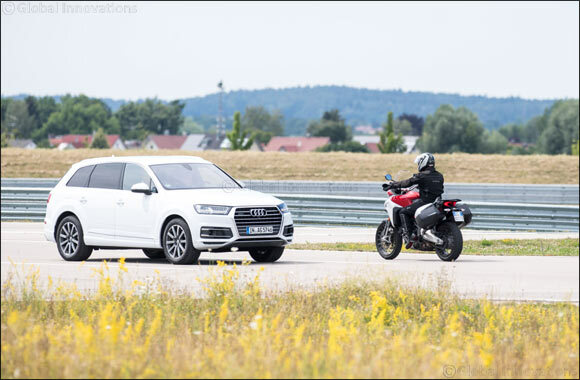 The demonstration featured Audi Q7 and Audi A4 road vehicles, as well as a Ducati Multistrada 1200 Enduro two-wheel vehicle equipped with C-V2X technology utilizing the Qualcomm® 9150 C-V2X chipset solution. The showcase demonstrated common situations that can take place between motorcycles and vehicles, and how C-V2X technology can be used to improve road safety. These include Intersection Collision Warning, where a vehicle equipped with C-V2X technology pulls out from a junction with an adjoining road and avoids hitting a motorcycle rider who has the right of way, as well as Across Traffic Turn Collision Risk Warning, in which a vehicle avoids a left turn collision with a motorcycle. These use cases are part of a wider set of advanced applications that have been demonstrated through the ConVeX project, which also involves vehicle-to-infrastructure (V2I) communication using roadside infrastructure units developed by SWARCO and vehicle-to-network (V2N) communication using Ericsson’s 4G/5G cellular test network operated at the motorway A9 German digital test field. The consortium is co-funded by the participating organizations and the German Federal Ministry of Transportation and Digital Infrastructure (BMVI) within the scope of the “Automated and Connected Driving on Digital Test Fields in Germany” program. As a part of the ConVeX consortium’s ongoing efforts to support the commercial deployment of C-V2X technology, the consortium is continuing to conduct field trials throughout the year to demonstrate the benefits of using a unified C-V2X connectivity platform, as defined by the 3rd Generation Partnership Project’s (3GPP) Release 14 standard, to showcase range, reliability, and latency advantages for real-time C-V2X direct communications. The goal is to highlight new use cases that are expected to help support traffic flow optimization, improve safety, and pave the path towards automated driving. During the trials, C-V2X direct communications for Vehicle-to-Vehicle (V2V), Vehicle-to-Infrastructure (V2I) and Vehicle-to-Pedestrian (V2P) scenarios operates over the 5.9 GHz ITS spectrum without the need for a Subscriber Identity Module (SIM), cellular subscription or network assistance. Complementing direct communication transmissions, network-based communications is designed to utilize the wireless operator’s 4G and emerging 5G wireless networks for Vehicle-to-Network (V2N) communication and operates over licensed operator spectrum to support telematics, connected infotainment, and a growing variety of advanced informational safety use cases. V2N scenarios for the trials operates on Ericsson’s 4G and 5G test network in Germany in the cellular 2.6GHz band. C-V2X technology is supported by a broad global automotive and telecom ecosystem, which includes the fast growing 5G Automotive Association (5GAA), in which Audi, Ericsson, and Qualcomm Incorporated are amongst the co-founders. The 5GAA involves over 85 members comprised of many leading automakers, Tier-1 suppliers, software developers, mobile operators, semiconductor companies, test equipment vendors, telecom suppliers, traffic signal suppliers, and road operators. C-V2X is a global solution for V2X communications to support improved automotive safety, automated & connected driving, and traffic efficiency, and is the only V2X technology based on globally recognized 3rd Generation Partnership Project (3GPP) specifications with ongoing evolution designed to offer forward compatibility with 5G, and leverages upper layer protocols defined by the automotive industry, including the European Telecommunications Standards Institute (ETSI) organizations.